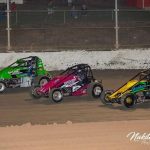 For the second season in a row, NSW has won the Northern Territory Wingless Sprint Title, with last weekend’s 2018 running of the event at Darwin’s Northline Speedway going the way of Nathan Dicker. While Saturday night delivered the current Darwin Champion with a flawless performance, having dominated both of the heat races, it wasn’t all smooth sailing for the western Sydney, NSW-based Dicker, who returned to the track following a DNF in Friday night’s preliminary feature race which was fresh in his mind. At the commencement of the 30-lap feature race, it was defending NT Champion Troy Carey (NSW) who made the best of the start to take the early lead, with the lone South Australian representative Brent Fox becoming embroiled in a battle for second with Dicker behind Carey. Determined to make amends for Friday night’s disappointment, Dicker refused to succumb to Fox, taking over the runner-up spot on lap four, immediately going on to pip Carey during the following lap to take control of the lead. From there, Dicker wasn’t stopped, sitting comfortably in first place for the remainder of the duration to claim his second title event victory in as many months. After taking over second from Carey on lap nine, Fox didn’t quite have the pace to challenge Dicker for the lead, but he was pleased to greet the chequered flag in a strong second place ahead of Carey. Once again, the highest-placed NT driver in back-to-back NT Title events, this time crossing the finish line in fourth place to complete the podium, Sean Tiedeman was pleased to hold on to his position after settling into fourth in the early stages of the race. 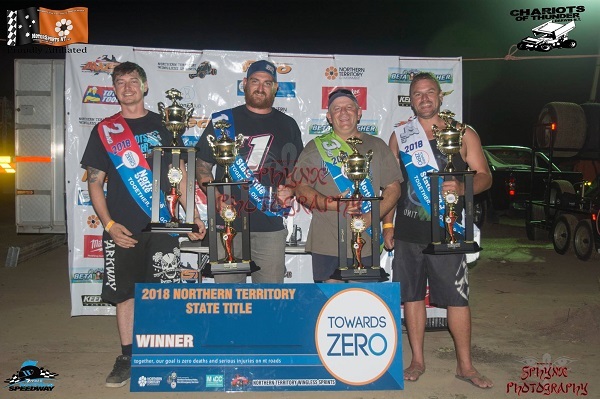 Rounding out the top-five finishers was Jamie McInnes (NT), while remaining finishers and fellow NT locals included Jarrod Garraway, newcomer Tyson Newcombe and Jarrod Goldoni. The weekend couldn’t have gotten much worse for Jason Davis (NSW), who mirrored Friday night’s result with a disappointing DNF in Saturday night’s feature race, while Josh Norman (NT) also experienced a retirement just six laps in. On the opening night of competition, Carey had looked in good stead to successfully defend his title after winning the preliminary feature race, ahead of McInnes and Norman in second and third place respectively. Goldoni, Tiedeman, Garraway, Fox, Brett Sommerville (NT), Darrin Uniacke (NT), Newcombe completed the finishers, while Dicker and Davis were unable to greet the chequered flag. Earlier in the night, the heat races were won by Sommerville and McInnes. Please Note: All NT Title results are to remain unofficial, up until engine checks are completed, which are required to be done within a 21-day period.